Referenced by AP_Win32Dialog_WordCount::_onInitDialog(), AP_Win32Dialog_WordCount::_updateWindowData(), AP_Win32Dialog_WordCount::activate(), AP_UnixDialog_WordCount::activate(), AP_UnixDialog_WordCount::constructDialog(), AP_Win32Dialog_WordCount::notifyActiveFrame(), and AP_UnixDialog_WordCount::notifyActiveFrame(). References CHARNSP_LBL_WID, CHARSP_LBL_WID, DIALOG_WID, XAP_App::getStringSet(), XAP_StringSet::getValueUTF8(), LINES_LBL_WID, XAP_Dialog::m_pApp, PAGES_LBL_WID, PARA_LBL_WID, XAP_Dialog::setWidgetLabel(), WORDS_LBL_WID, and WORDSNF_LBL_WID. Referenced by AP_UnixDialog_WordCount::constructDialog(), and AP_CocoaDialog_WordCount::runModeless. Referenced by s_doWordCountDlg(), and setCountFromActiveFrame(). References FV_View::countWords(), XAP_Dialog_Modeless::getActiveFrame(), XAP_Frame::getCurrentView(), AV_View::isLayoutFilling(), and setCount(). 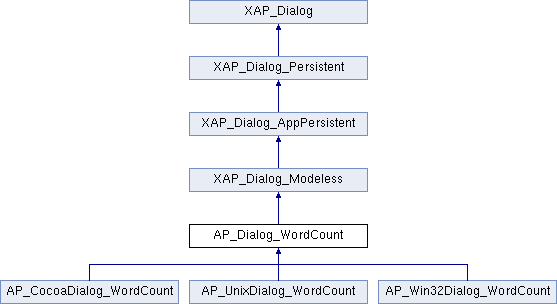 Referenced by AP_UnixDialog_WordCount::activate(), AP_UnixDialog_WordCount::autoupdateWC(), AP_Win32Dialog_WordCount::event_Update(), AP_CocoaDialog_WordCount::event_Update, and AP_UnixDialog_WordCount::notifyActiveFrame(). References FV_DocCount::ch_no, FV_DocCount::ch_sp, CHARNSP_VAL_WID, CHARSP_VAL_WID, XAP_Dialog_Modeless::getActiveFrame(), FV_DocCount::line, LINES_VAL_WID, m_count, FV_DocCount::page, PAGES_VAL_WID, FV_DocCount::para, PARA_VAL_WID, XAP_Dialog::setWidgetLabel(), XAP_Dialog::setWidgetValueInt(), TITLE_LBL_WID, FV_DocCount::word, FV_DocCount::words_no_notes, WORDS_VAL_WID, and WORDSNF_VAL_WID. Referenced by AP_UnixDialog_WordCount::activate(), AP_UnixDialog_WordCount::autoupdateWC(), AP_CocoaDialog_WordCount::event_Update, AP_UnixDialog_WordCount::notifyActiveFrame(), and AP_UnixDialog_WordCount::runModeless(). Referenced by AP_Win32Dialog_WordCount::_onCommand(), AP_Dialog_WordCount(), AP_UnixDialog_WordCount::destroy(), AP_CocoaDialog_WordCount::destroy, AP_CocoaDialog_WordCount::event_CloseWindow, AP_UnixDialog_WordCount::event_OK(), AP_UnixDialog_WordCount::event_WindowDelete(), and getAnswer(). Referenced by AP_Win32Dialog_WordCount::_updateWindowData(), AP_Dialog_WordCount(), getCount(), setCount(), and updateDialogData(). Referenced by AP_Win32Dialog_WordCount::_onInitDialog(), AP_Win32Dialog_WordCount::_updateWindowData(), AP_Win32Dialog_WordCount::activate(), AP_UnixDialog_WordCount::activate(), AP_UnixDialog_WordCount::constructDialog(), ConstructWindowName(), AP_Win32Dialog_WordCount::notifyActiveFrame(), and AP_UnixDialog_WordCount::notifyActiveFrame().